This is my most favorite coffee that I sell. It is only roasted to order. It is not a coffee for dark roasts and I tend to roast it on the light- medium level, usually blending slightly different roast levels together. It is also the hardest coffee to roast since it is a very special Natural Process coffee. Most roasters sell this coffee for up to $20 for a twelve oz. bag plus shipping. Because I am a really small roaster who works from home my price can be lower. Also nobody knows who I am. Wow! What a great natural process bean. If you like the big juicy fruit of Sidamo than you will love this highly rated coffee by coffee review online. Coffee Review gave it 95 Points! Grown in the Guji area of Sidamo growing region on farms around Machicha village, this Ethiopian coffee is a dry or natural processed coffee, meaning the beans were dried inside the fruit . 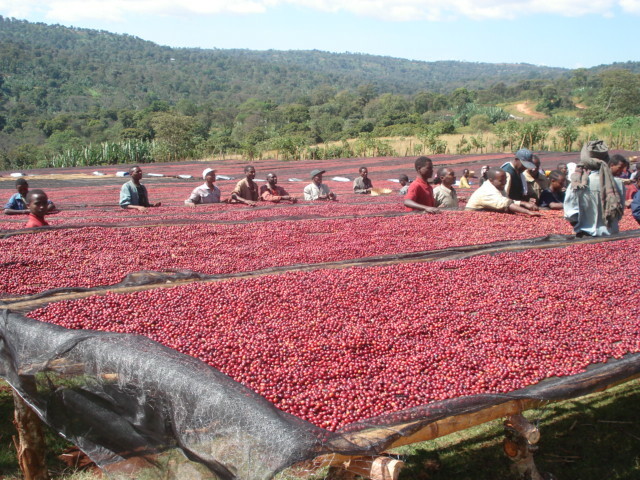 SIDAMA ARDI TASTING NOTES: Strawberry, Juicy, Floral and Sweet It turns out Ethiopia is the birthplace of more than just coffee! The oldest human skeleton ever found, over 4.4 million years old, was found in Ethiopia and named Ardi. Samuel, the owner of Keffa Coffee, named this sweet coffee after our ancient ancestor. Ardi is a natural processed coffee under exporter’s care. After being picked by hand it’s dried on a raised bed in the sun for three weeks. During this process sorting the under-ripe cherry is continued by skillful workers. Keffa’s local agent supervises the site to ensure the very best quality. REGION INFORMATION Country: Ethiopia City: Sidama Town: Kilenso Moconissa Altitude: 1850-1950 M Varietals: Heirloom Process: Natural *Trademark Registered By Keffa Coffee Importer Info: Quality Keffa Coffee implements the highest standards of quality control from start to finish. In Ethiopia the beans are subjected to a rigorous sorting process from screen size, to color sorting, to meticulous hand sorting at the rate of 16kg/12 minutes. And the quality of our coffees just keeps improving. This year our Harrar got upgraded to Grade 1. Our patented YirgZ has zero defect. Beyond the farms and mills we work with transport companies who specialize in handling green coffee. This ensures the product preserves great quality all the way to the roastery. Our team works hard to seek the most competitive shipping rates by comparing companies and customizing the best shipping option for each client. We are continuously adapting innovative ways to maintain freshness and enhance quality from the origin to your roastery. Behind The Beans Every cup of coffee brewed is impacting lives globally. Keffa Coffee is committed to growing community and improving the livelihoods of every person involved in producing our coffees. We focus on the needs of our partners – specialty growers, mill owners, exporters at origin, and roasters – all of whom share our commitment and passion for outstanding coffee. Our strong relationships at origin and direct sourcing approach ensure that our coffee is procured from fairly treated, and fairly paid workers. Even as the market fluctuates and coffee prices rise and fall, our farmers and picker’s wages stay consistent. We pay 3 times more than the average wage to the women who sort our beans. Paying higher wages allows women to send their children to school and creates a higher quality of life for their whole family. Pictures from the farms are always available upon request and we are always happy to discuss origin and production with our customers.